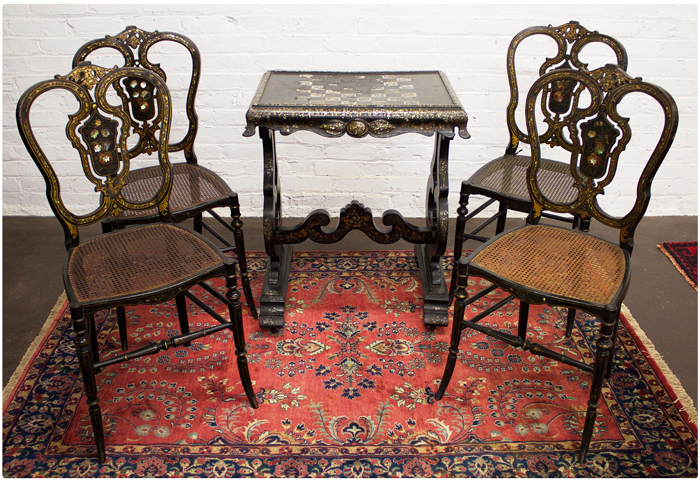 You may want to avoid the matchy-matchy look when decorating your home solely with antique furniture and accessories. Rather than dominating a room with antique pieces, a more effective and exciting look can be achieved by coordinating rich beautiful antique heirloom quality pieces with modern decor. Decorating a room with different furniture styles, colors, and patterns is exciting and fresh — and all you might need is a little bit of inspiration to pull it off. Here are some great interior design ideas for mixing antique and modern designs so that your space looks fresh, contemporary and individualistic. 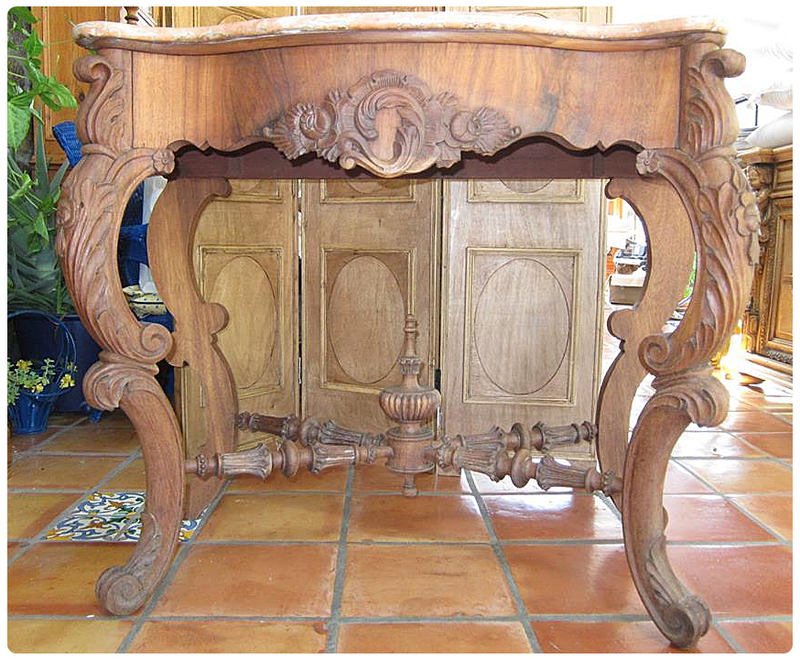 Placing antique furniture in non-traditional spaces and for different end uses in another fresh way to decorate. Use an antique vitrine in the bathroom for your towels, soaps and decorative items such as candles, sachets and necessity filled straw boxes. Traditionally a dining room fixture, this useful piece can add an unexpected beautiful element and well needed storage typically left to closets and under sinks. This image shows how placing a piece of furniture in a non-traditional place can be refreshing, modern and creative. 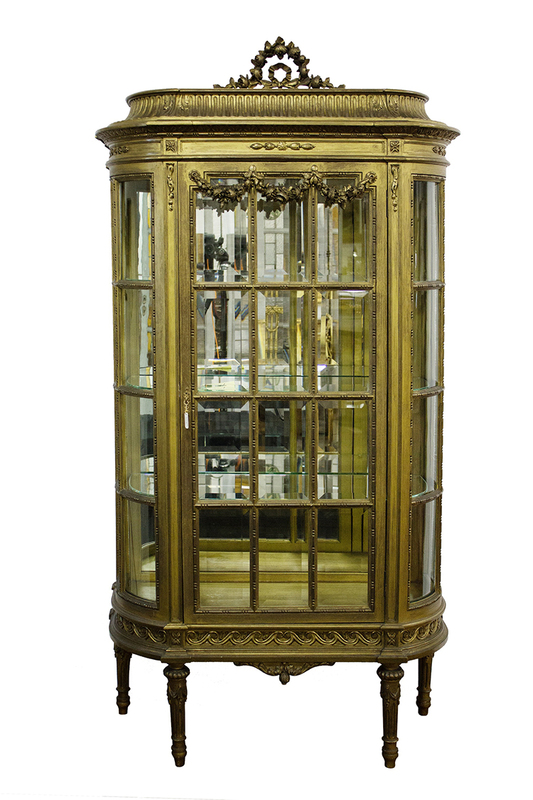 Schweitzer Linen offers a gilt 4-legged Vitrine with faceted glass panes which would be perfectly showcased in an elegant modern bathroom. Imagine this heirloom piece filled with lofty modern white cotton towels, monogrammed embroidered hand towels and all things bathroom decorative. 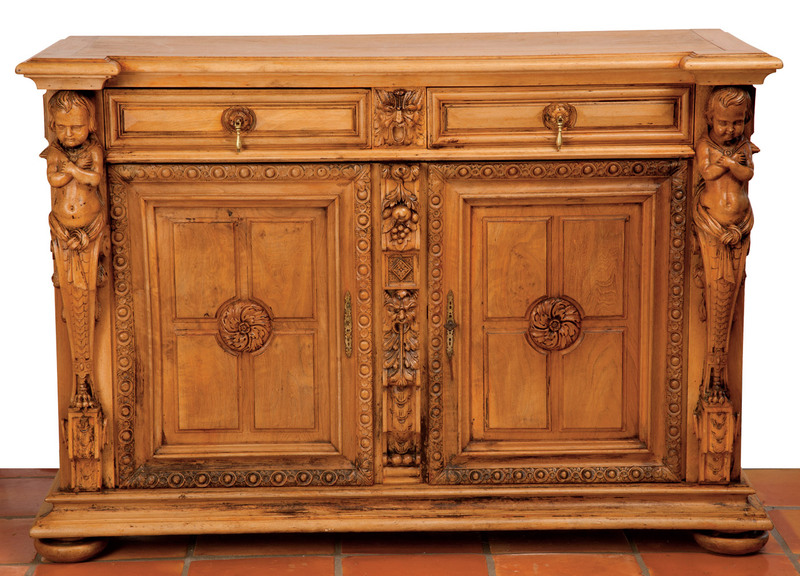 Combine this precious antique breakfront with modern and simple accents for an effective and updated contrast. 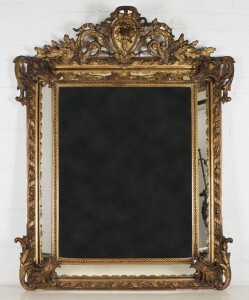 This Schweitzer Linen dramatic gilt-framed mirror below would make a gorgeous and modern bed headboard. 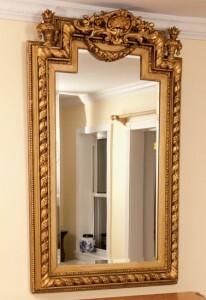 You can also top your bathroom sink with a precious gilt framed mirror. Most bathrooms today are modern and minimal and the contrast of these precious gilt-framed mirrors creates an unexpected element of excitement. 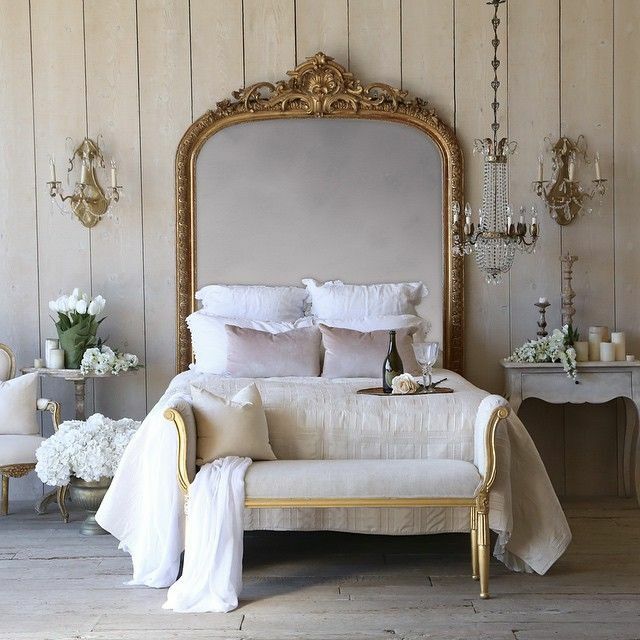 Be sure to furnish the rest of the bedroom with modern minimal pieces to contrast with this dramatic mirror, like a sleek loveseat with a Schweitzer Linen cashmere or alpaca throw to add texture. 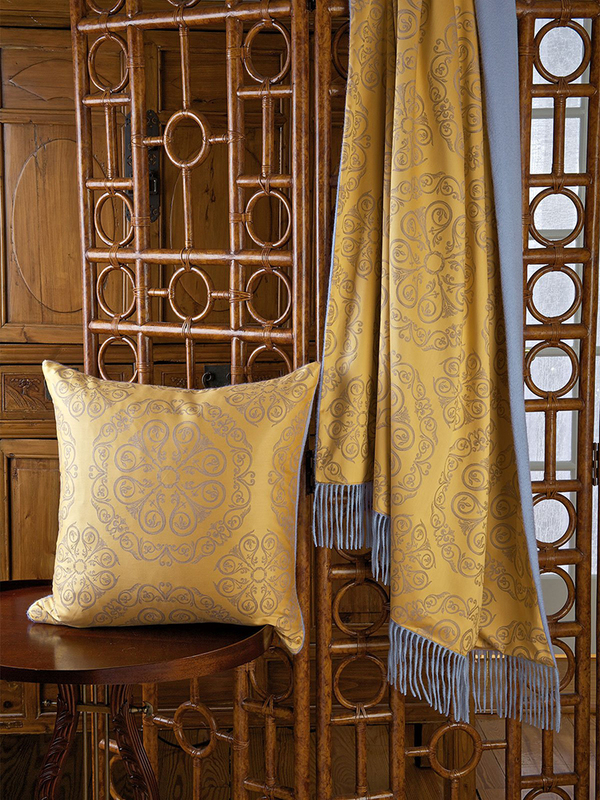 Our exclusive design combines the majesty of 500 thread count Gold Italian damask in a rich medallion weave, with the pure and utter luxury of Blue cashmere. 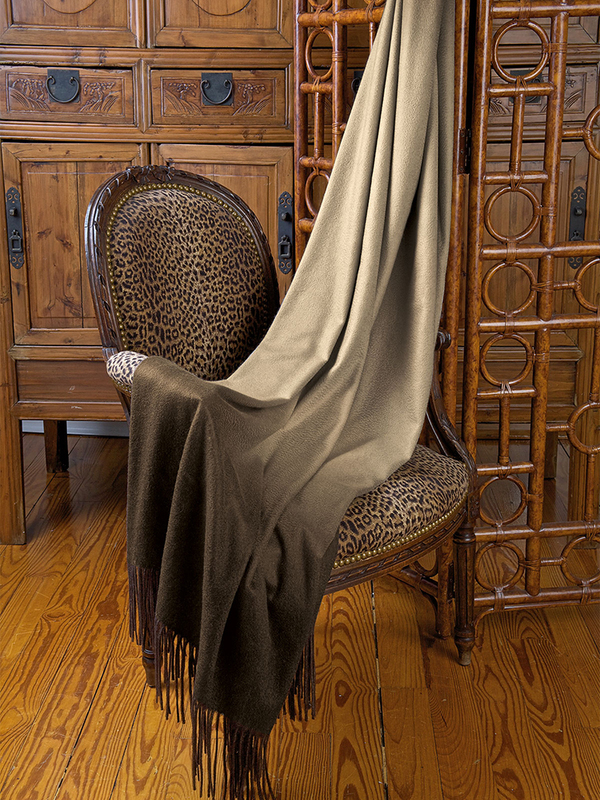 The incomparable result is a reversible fringed throw that glows with elegance while comforting you with luxurious warmth. Matching pillow is currently out-of-stock. Made in the USA of imported fabrics. Dry clean only. Pure 100% cashmere, with all the sumptuous, sensual softness you expect of this prized fiber, is unexpectedly adorned with a luxurious overlay of intriguing lace. Imported for your most special times, in Gold or Cocoa, with fringed ends. Even if you have never imagined riding a hunting trail, this dream of a throw is for you. Made in Peru of the finest and softest baby alpaca, to cuddle and comfort you with incomparable warmth and luxury, it’s woven with chains of designer look stirrups and finished with whipstitched edges. 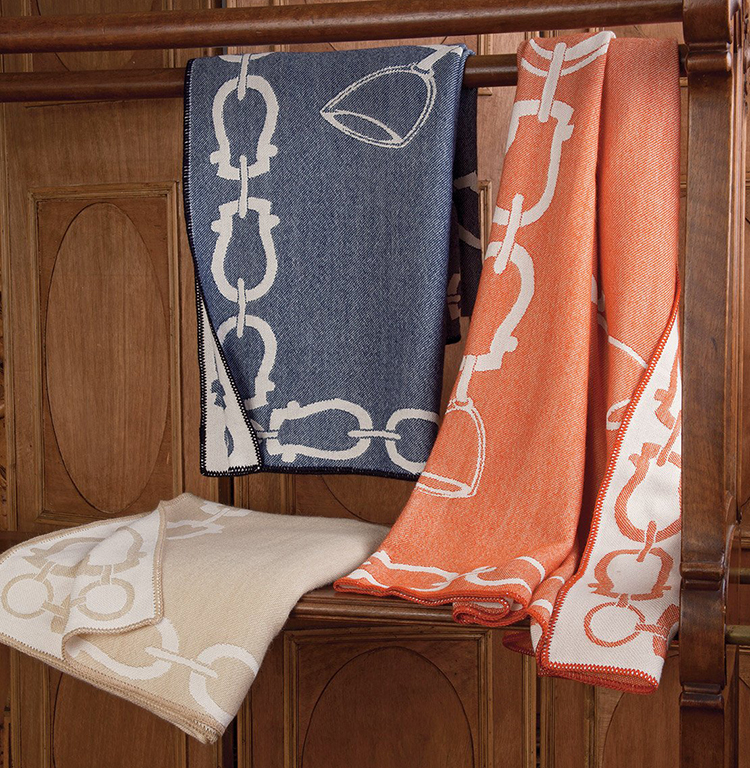 Navy, Orange or Beige with Off-White reverses to Off-White with Navy, Orange or Beige. Ultra soft, ultra smooth to the touch, ultra luxurious in every way, this very special throw is made of 100% pure cashmere, 550 grams per square meter. Imported, in luscious ombré shading as shown, extravagantly sized and fringed at both ends, it will tempt you to snuggle up in all its splendor more often than not. Dry clean only. 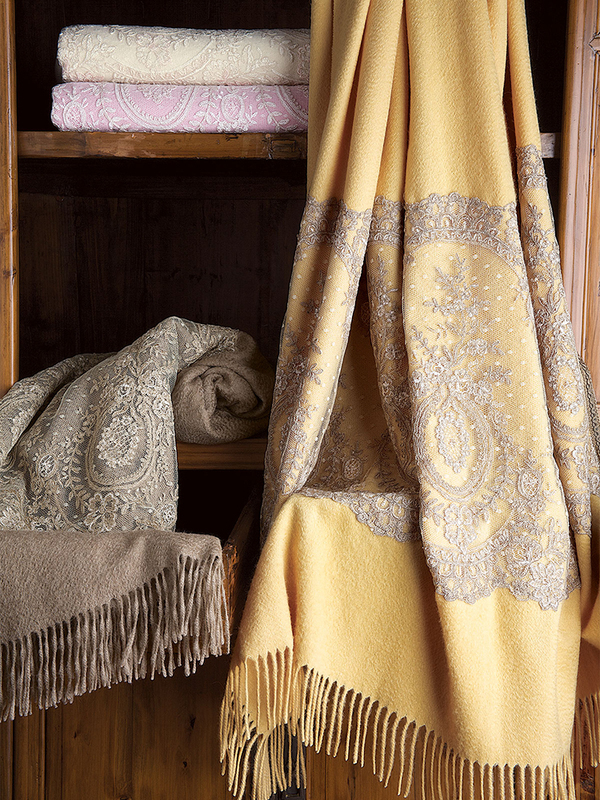 Turning fantasy into reality, this marvelous reversible throw meets your highest aspirations with an aristocratic coupling of jewel-like Red and Gold paisley, 500 thread count Egyptian cotton damask and pure cashmere in solid Gold. Finely made in the USA (of imported materials) with fringed ends. Matching decorative pillow is filled with 95% feathers, 5% down. Add a finishing touch with a clear crystal chandelier to create the be-all and end-all Antique and Modern bedroom. 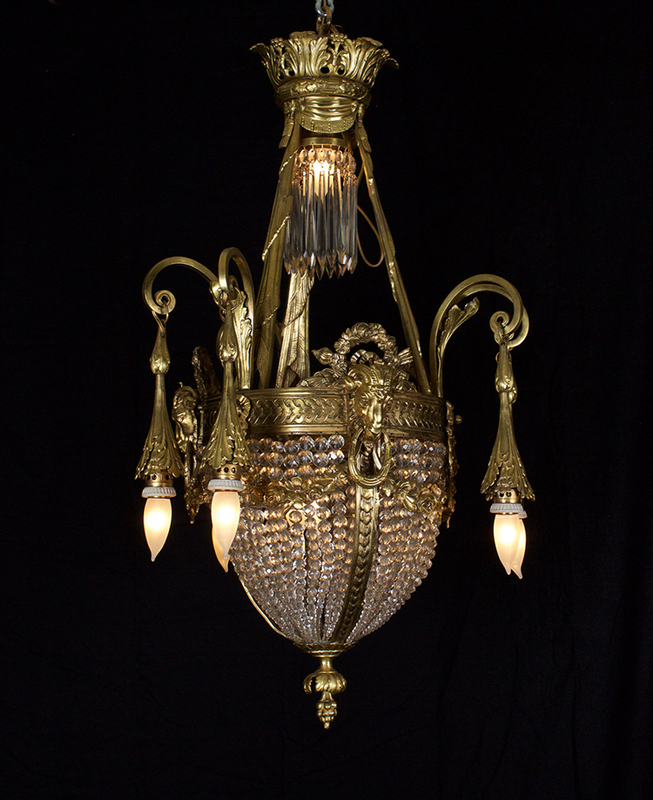 Schweitzer Linen carries dramatic antique crystal chandeliers dating back to the 1800’s in various sizes and shapes. [Left] France circa XIX made of crystal and remarkable bronze work. Truly a museum piece. 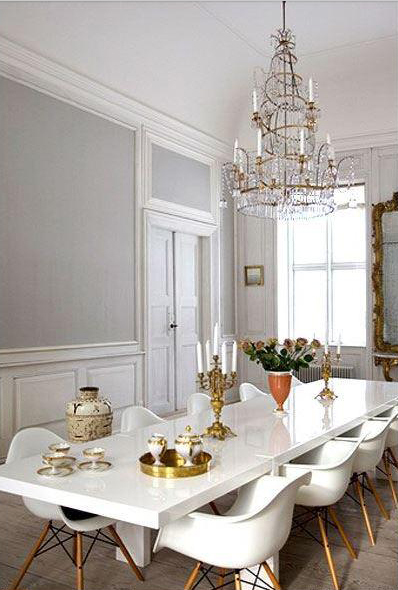 And look at how larger chandeliers are the perfect contrast in your modern dining room. The smaller ones add charm and that special contradiction to an updated powder room. 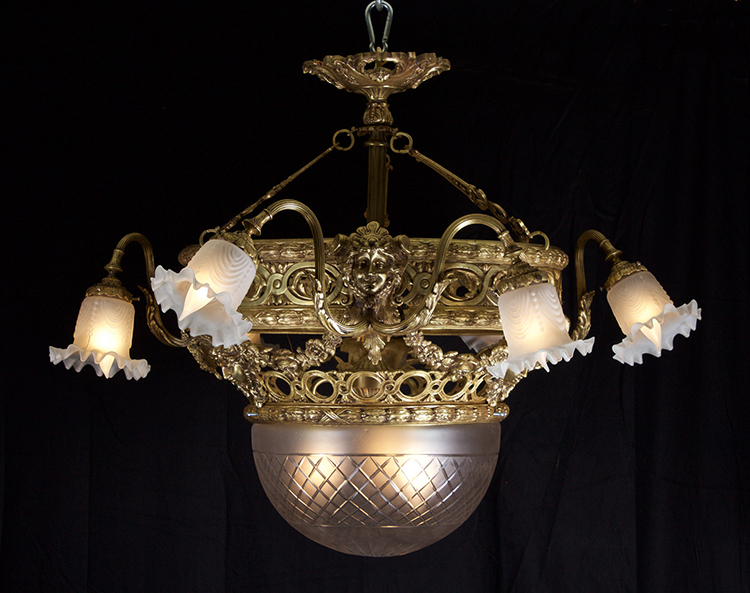 Install dramatic antique chandeliers in your modern beach house, or casual farm-style home. 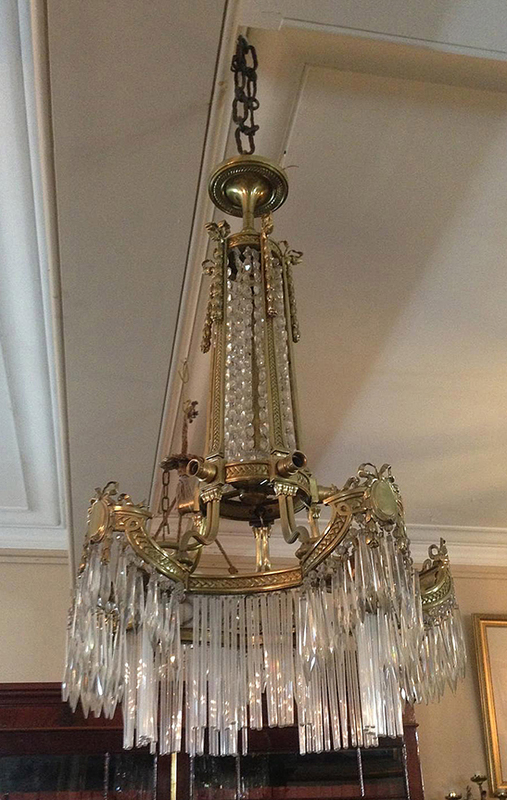 Interior designers contrast these precious antique crystal pieces with modern furniture to create an updated fresh look. 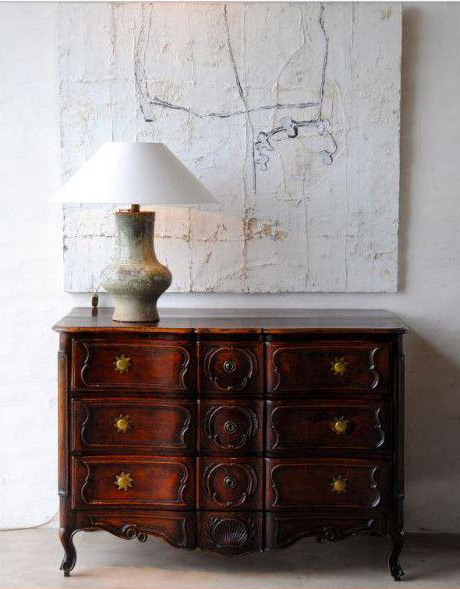 Top your antique dresser with modern art and minimal accessories. A large modern textural painting gives a great contrast to precious antique furniture. Note how clean and fresh the look on the right is. You can achieve a similar modern and antique mix with Schweitzer Linen’s French Walnut 19th Century Sideboard which can be used as a dresser. Add modern and minimal features to add contrast. A lovely way to turn everyday tissues into a secret cache. 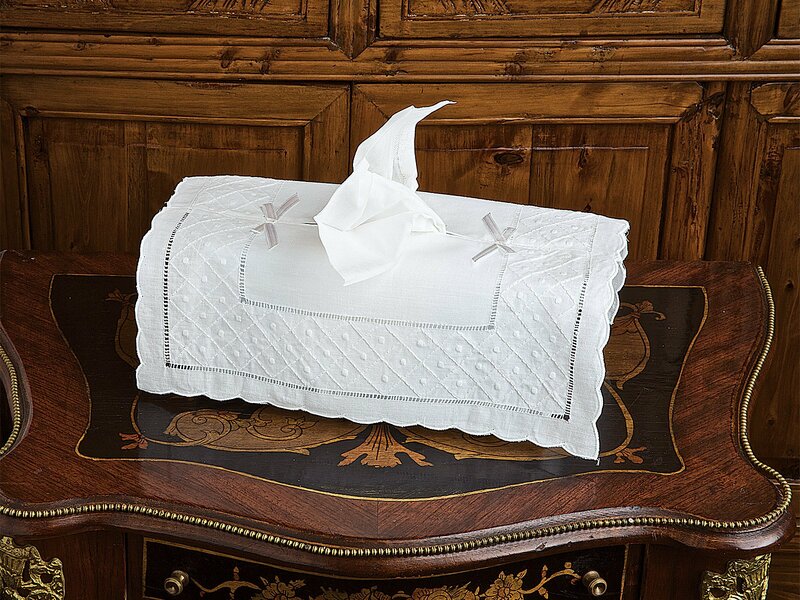 Schweitzer Linen imported tissue box covers are made of pure white linen, so pretty and pristine, all are delicately adorned with scalloped edges, embroidered by hand and hemstitched by hand. 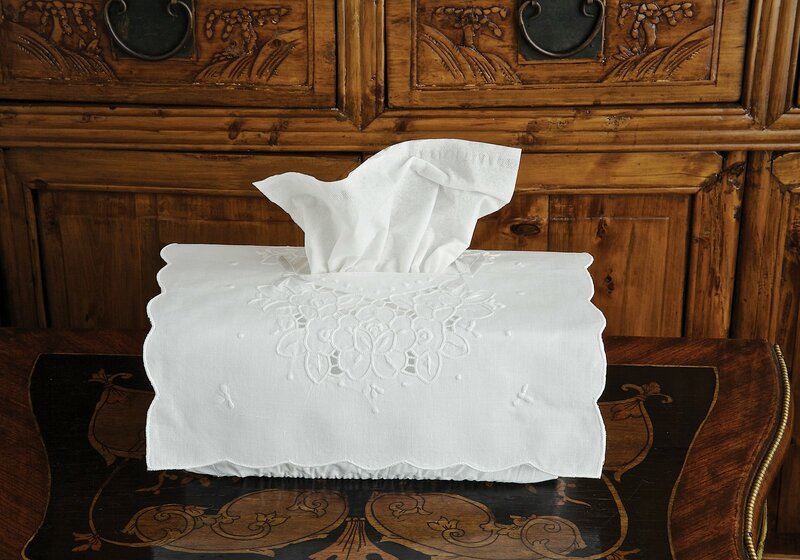 Snug elastic underpinning keeps standard size tissue boxes in hiding, so they never interfere with your décor. Accent precious antique chairs with bright solid and print pillows, modern multicolor rugs and geometric patterned couches. 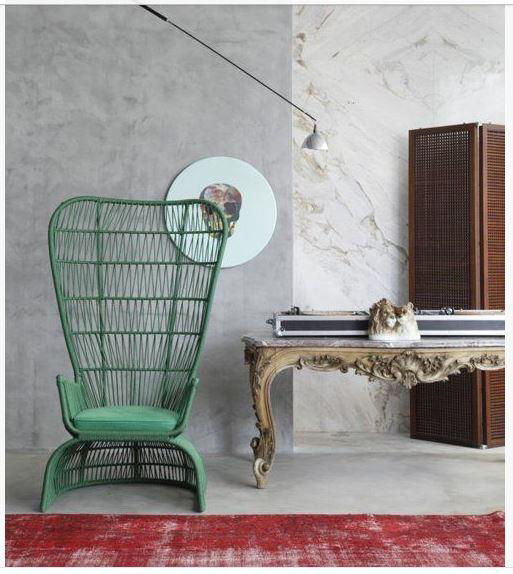 Mix these antique prizes with “modern” and be inspired by your favorite colors. Perfect summer brights can be yellow and turquoise, and winter colors could be deeper intense teal, chartreuse and saturated purple, for total color contrast and excitement. Remember that your wall color is important and can be a mid-cool or warm tone to complete the marriage of Modern and Antique. Schweitzer Linen offers beautiful woven seat antique chairs that would have a similar look in a modern home. Contrasting these with dramatic color and modern prints results in a fresh and updated look. 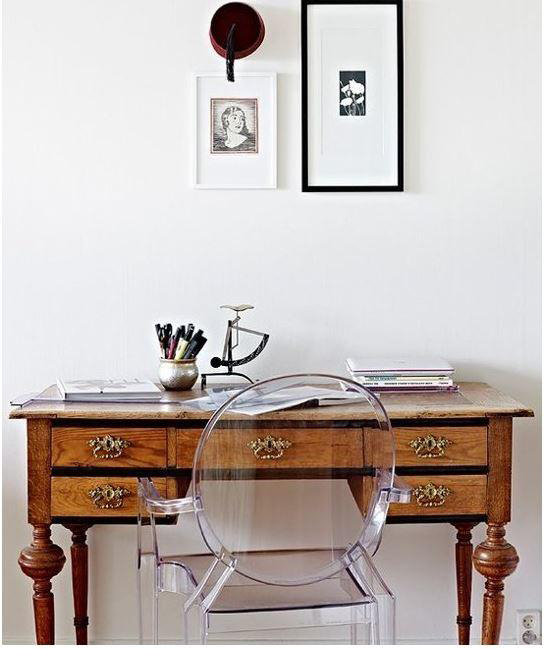 Contrast a precious antique desk with your modern chairs and sensibilities. Notice how updated this vintage piece looks with clear acrylic chairs, topped with modern framed artwork. 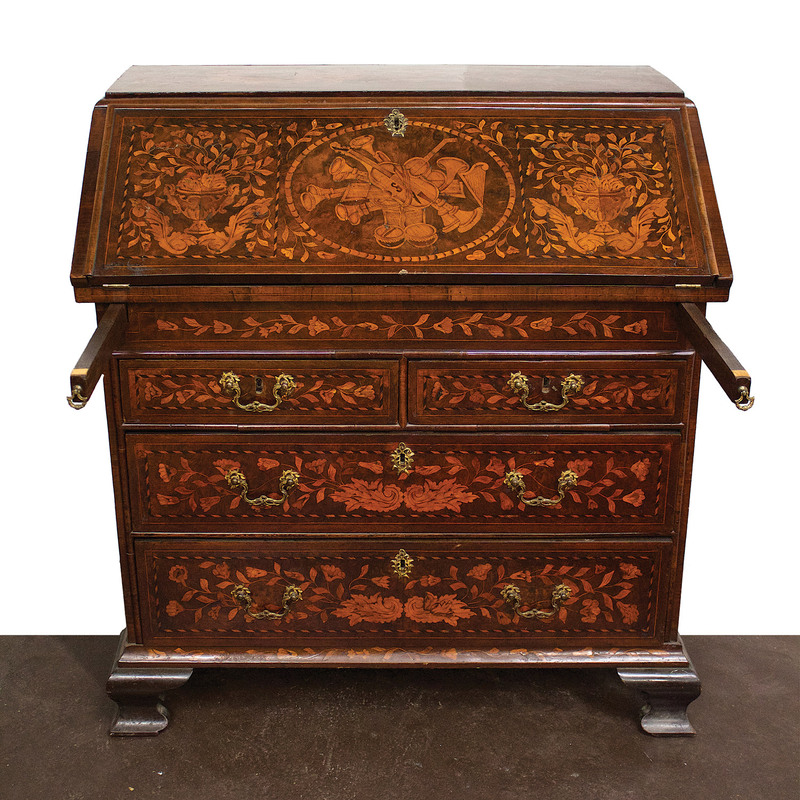 You can achieve this updated contrasting look with Schweitzer Linen’s antique walnut Secretaire with a drop down desk leaf. 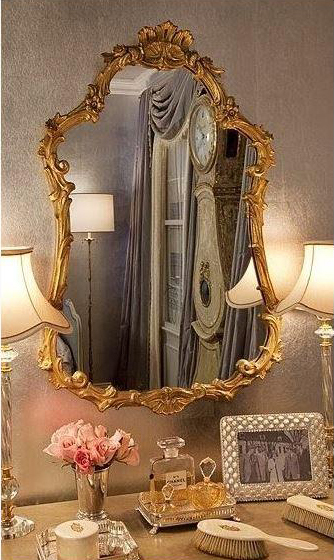 Be inspired by contrasting this gorgeous piece with updated and modern accents. Combine your precious vintage console table with the unexpected woven modern chair and updated artwork. 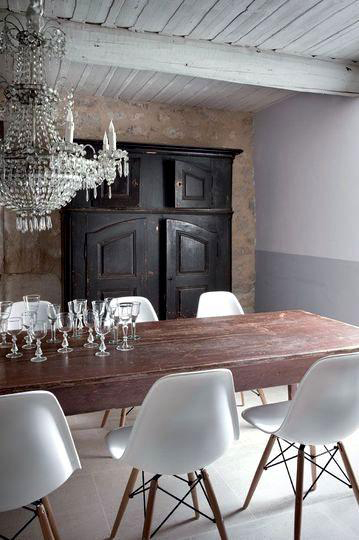 This is a perfect example of how the unexpected mix of antique and modern provides updated drama. 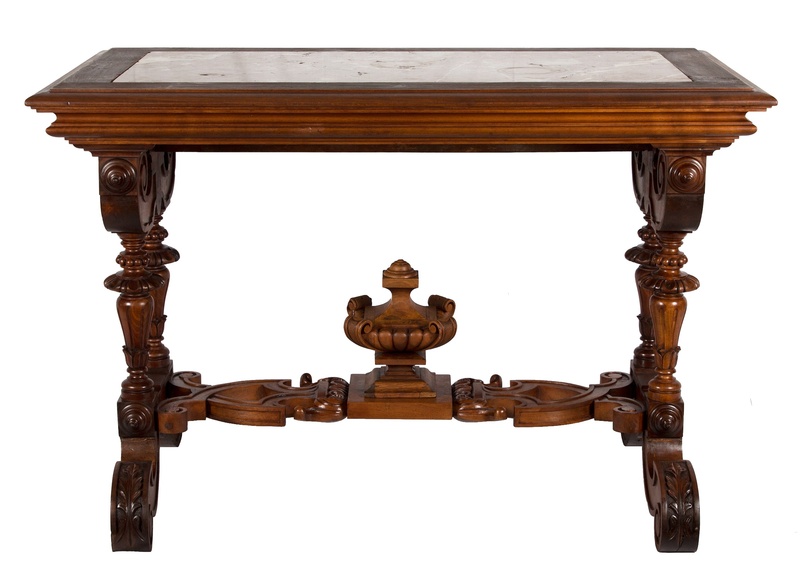 Schweitzer Linen has antique console tables that would be perfect as a foils for your hip and modern furnishings and tastes. 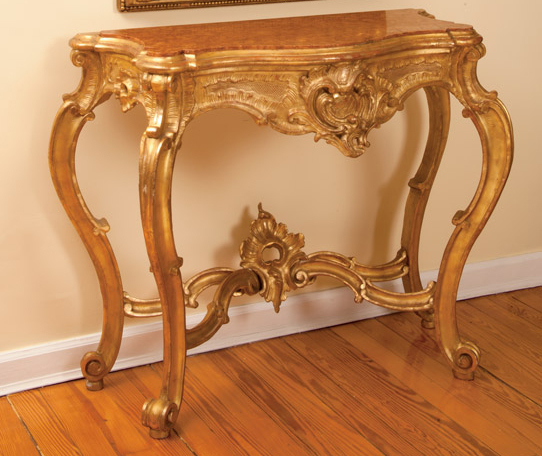 Whether you want to start with an antique console table with allover gilt finish, or wish to use a marble topped walnut console, you will have a gorgeous antique to contrast your modern pieces.